In light of the migration crisis in the Mediterranean, what lessons can Europe learn from other countries’ attempts to deal with irregular migration? Luisa Feline Freier and Diego Acosta Arcarazo write on South America’s approach to the issue, where several countries have adopted a more accommodating stance toward irregular migrants in recent years. They argue that despite a number of inconsistencies, the shift in philosophy in South American immigration policies – which has culminated in the granting of a universal right to migrate in some countries – challenges the criminalisation of irregular migrants in Europe and North America. In South America, on the other hand, over the course of the past 15 years many governments have turned away from the previously often openly racist ‘criminalization’ of irregular immigrants and adopted surprisingly liberal discourses of universally welcoming all immigrants, irrespective of their origin and migratory status. Instead of distinguishing between desired ‘legal’ and undesired ‘illegal’ immigrants, South American politicians stress non-discrimination, the universality of migrants’ human rights irrespective of their status. Significant ‘discursive’ gaps persist between such liberal political talk and the securitized immigration laws that were passed under authoritarian governments of the 1970s and 1980s, such as in the cases of Brazil, Ecuador or Chile. At the same time, a substantial number of countries in South America went on to pass new constitutions and laws that reflect the new governmental discourses to varying degrees. Among others, Argentina’s 2004 Migration Law and Ecuador’s 2008 Constitution go as far as to stipulate a ‘human right to migrate’. Ecuador also implemented universal visa freedom, albeit short-lived, in 2008, thereby de facto opening its borders. But what does a “human right to migrate” mean in practice? In the context of irregular immigration, it can be understood in two possible ways: as an obligation of the state to provide regularization avenues and as an individual right to have a time period in which to attempt to regularize. If in fact a true right to migrate exists in a country, those who, for one reason or another, irregularly reside in the country should have ample possibilities to regularize their status – and this should apply to all immigrants regardless of their origin. Asian and African immigrants and immigrants of colour have historically been most discriminated against in South America. Accordingly, examining governments’ reactions to recent increases in south-south inflows from Asia, Africa and the Caribbean allows us to test just how far the liberalization of policies is applied in practice. Indeed, contrary to the universality of rights that their discourses invoke, the actions of the governments of Argentina, Brazil and Ecuador, have tended to manifest a rejection of increasing irregular south-south migration from outside the region. Argentina and Brazil present similar cases. Although Brazil has not (yet) liberalized its legislation, Brazilian President Lula da Silva promised that his country would be generous towards people from any part of the world who would like to come and build a future in Brazil. Both countries implemented specific regularization programmes for the largest groups of irregular extra-regional immigrants: Senegalese, Dominicans and Haitians. This has benefited around 3000 Senegalese and another 3000 Dominicans in the Argentinean case. In Brazil around 30.000 Haitians have benefited from a special residence permit. Other extra-regional migrants in an irregular situation do not have the possibility to regularize their status in Brazil although they may be able to do so under certain conditions in Argentina. In Ecuador, the gap between discourse and policy reactions to extra-regional immigration is widest. Extremely small numbers of new immigrants led the government to abandon its policy of universal visa-free access and there are almost no regularization measures. There are at least three reasons to explain this reverse paradox of publically welcoming all immigrants regardless of legal status or national origin, but de facto excluding extra-regional south-south. First and foremost, it is important to understand that the liberalization of immigration discourses has evolved to be politically coherent in the context of diaspora and foreign policies. In the context of the mass emigration of their citizens to North America and Europe, it was in the political interest of South American countries to reject restrictive immigration discourses and policies of ‘northern’ governments. This has to be understood in the wider context of the positioning by left of centre governments against the supremacy of Europe and the USA. For example, when implementing the regulation of the 2004 law in 2010, Argentina’s President Christina Kirchner publically rejected the re-emergence of xenophobic sentiments in “so-called developed countries” in the context of the financial crisis and explicitly described Argentina as part of the worldwide, morally superior, avant-garde in immigration policy making. Second, immigration policy liberalization is taking place in the context of regional integration. Thus, the implementation of regularization procedures and the MERCOSUR residence agreement primarily target regional migrants. The majority of all migratory movements in South America are intra-regional and one main factor leading to policy liberalization was the large percentage of regional migrants in an irregular situation. Third, restrictive reactions to extra-continental immigrants are also intertwined with racial discrimination. Indeed, South American politicians are likely to be caught in the dilemma of serving somewhat schizophrenic public opinion; the demand for migrants’ rights and regularization programs for emigrants in Europe and the United States and the concurrent acceptance of the liberalization of immigration policies in light of political coherence, on the one hand, and protectionist, and even racist, public opinion, on the other. Although other countries in the region such as Uruguay (2008) and Bolivia (2013) have recently adopted similarly liberal immigration laws, including the right to migrate, and reform projects are currently being discussed in the Ecuadorian, Chilean and Brazilian legislatures, a full implementation of the populist declaration of a universal right to migrate –i.e. the de facto opening of borders through universal visa-free travel coupled with regularization mechanisms– is very unlikely. That being said, it is impossible to deny that the philosophical paradigm shift that forms the bases of these reforms represents a remarkably different approach when compared to the ongoing fatal criminalization of irregular migrants that is the dominant theme in Europe and North America and challenges well-established assumptions on how to regulate migration. The coming years will reveal its lasting impact on new legislations and their actual implementation. This post is based on the article “Turning the Immigration Policy Paradox Upside Down? Populist Liberalism and Discursive Gaps in South America“ in the International Migration Review. See also ‘Beyond smoke and mirrors? 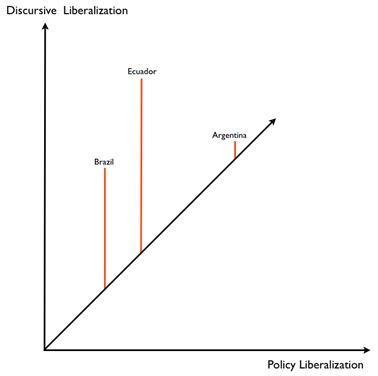 Discursive gaps in the liberalisation of South American immigration laws’ (L. F. Freier and D. Acosta Arcarazo) in D. J. Cantor, L. F. Freier and J.-P. Gauci (eds.) A Liberal Tide? Immigration and Asylum Law and Policy in Latin America (London, Institute of Latin American Studies, 2015), pp. 33-56. Diego Acosta Arcarazo is a Lecturer in European Law at the University of Bristol. He was previously Lecturer in Law at the University of Sheffield and holds a PhD in European Law from Kings College London. His area of expertise is EU Migration Law and he is currently interested in migration law and policies in South America and in the process of construction of a South American citizenship. Southamerica is one of the very few regions (EU even harder) with open door inmigration rules to anybody, not just for Southamericans. You dont need to ask for refuge nor work permits before arrivals, indeed you can become a National working in the retail, restaurants or as nurse. Forget high skilled requirements, governments need “no-elite” people too to support the model. A clue, look further about the social security, inequality, education, wages and cost of life. The coin have 2 sides.